Released on September 29, 2017 in NA, there was a lot of uncertainty about availability and stock levels after last years disasterous NES Classic Edition rollout. Nintendo promised it's SNES Classic Edition would be amply stocked so fans would be able to buy it. From what I saw and read, this seemed to be true. Still, you won't find them piled on shelves - they sell out quickly. At a higher price of $80, the SNES mini console is similar to the former NES model, but comes with two controllers. Oddly it has fewer built-in games. I thought subsequent releases usually had more games... oh well. While 21 games seems scant, they are truly amazing games and even includes formerly unreleased game, Starfox 2! It was distributed in three variations: the original systems released in Japan, North America, and Europe. The North American release features the straight-angled gray and purple design of the SNES, the Japan and PAL region releases are modelled after the rounded edge Super Famicom design. Internally, the console uses hardware similar to that of the NES Classic Edition. It uses an Allwinner R16 system on a chip with four ARM Cortex-A7 central processing unit and an ARM Mali 400 MP2 graphics processing unit. It includes 512 MB of flash storage and 256 MB of DDR3 memory. The actual controller ports are hidden behind a front flap designed to look like the original Super NES controller ports. 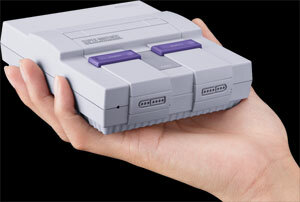 The SNES Classic Edition controllers have connectors that can be inserted into the Wiimemote to play Super NES games on the Wii and Wii U Virtual Console. The Wii's Classic Controller is also compatible with the Super NES Classic Edition.